Cylinder axial stress calculator - formula & step by step calculation to find the longitudinal stress developed along the cylinder or pipe having both ends closed due to the internal pressure. σL = (P x d)/(4 x t). The internal pressure act on cylinder or pipe to develope the force along the axis of cylinder or pipe is called axial or longitudinal stess. 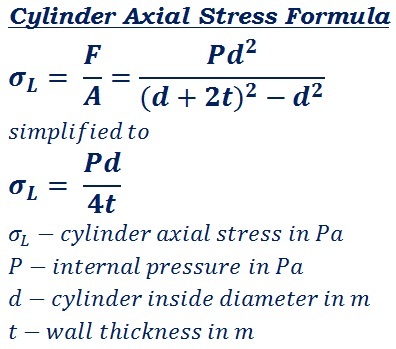 Internal pressure σL in Pa, internal pressure P in Pa, cylinder inside diameter d in m & wall thickness in m are the key terms of this calculation. The below mathematical formula is used in mechanical engineering to calculate the capacity of the pipe or cylinder to with stand the force developed along the longitudinal axis of the cylinder due to its closed ends & the internal pressure. Besides, the step by step calculation for each calculation performed by using this calculator let the users to know how to perform axial stress calculation. In the field of mechanical engineering, while working with oil & gas industry pipe line system, it's important to analyse capacity of the pipe line. The above formula & step by step calculation may be useful for users to understand how the values are being used in the formula to find the cylinder axial stress σL, however, when it comes to online for quick calculations, this cd exponent calculator helps the user to perform & verify such mechanical engineering calculations as quick as possible.